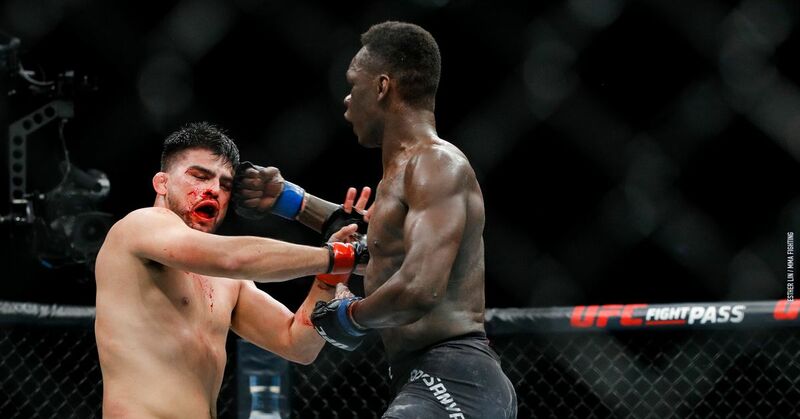 The UFC 236 co-main event just crowned an interim middleweight champion when the promotion's after the promotion's # 5 ranked middleweight Israel Adesanya and the # 4 ranked Kelvin Gastelum waged absolute war in a Fight of the Year candidate. After it was all said and done, it was Adesanya who walked away with the unanimous decision and a shiny new belt. Adesanya just might have a date with Robert Whittaker to unify the titles. A bit of calculating went to kick off the bout, with each man measuring the other. Gastelum exploded with a right hook that wobbled his opponent, but Adesanya recovered really quickly. Gastelum was throwing his hands with terrible intentions, leaving Adesanya mostly defensive for the rest of the round. Adesanya started kicking the body in the second round. Gastelum started to throw his hands again, pressuring Adesanya, but ended up getting dropped with a punch. Gastelum started to look back, seeming to have recovered, but Adesanya started to look more confident. Adesanya began to land with his punches, and then a crazy spinning back elbow briefly rocked Gastelum. This was a much better round for Adesanya. Gastelum got back into the fight early in the third round, throwing more volume than he did in the second act. Adesanya kept sniping though, countering his opponent's forward pressure with straight punches. With just under 90 seconds left in the round, Gastelum scored a takedown, but Adesanya was quick to stand back up. Gastelum came out aggressive for the fourth frame, backing up Adesanya to the fence. Adesanya did a great job of not allowing himself to be trapped and returned to open space. Gastelum kept up the pressure, hooking his way into the clinch. Just when Gastelum seemed to be gaining ground, Adesanya started to tee off. Then, a high kick from Gastelum wobbled Adesanya, and he went in with punches. Adesanya survived the round. The war continued into the fifth and final round. A hard right hand stung Gastelum, and Adesanya locked up a tight guillotine, but Gastelum escaped into top position. Then, Adesanya threw up a triangle attempt and Gastelum escaped again. Back on the feet, another hard right buzzed Gastelum, and then another. Then one of them dropped Gastelum, but he recovered. Adesanya dropped his foot with another right hand and started going for the kill, dropping elbows. Gastelum got back to his feet and ate some more punches than the fight came to a close. Wow!